Extracted from "Touching the Face of God" by Bob Russell, published by Huntington House Publishers, Lafayette LA, 1992. Available from: Bevo Press, 1022 Calhoun St ,Columbia, S.C. 29201. The price is 10.95 a copy. Bob Russell, a great airshow pilot in his own right, was also a friend and protégé of Bevo Howard. He was also flying the airshow in Greenville NC on the day when "...even the best and safest pilots face a world of uncertainties, and sometimes their luck runs out." It occurred in Greenville, North Carolina, on a day in late October (1971). There was a huge crowd present, but their attention was divided between what was going on in the air above them and what was happening on a faraway baseball diamond. The World Series was in progress, and many members of the audience would watch the aircraft performing while holding transistor radios against their ears. There were even a few portable TVs scattered throughout the crowd, with clusters of baseball fans huddled around during the lulls between flying acts, watching tiny figures run across six-inch screen. And everywhere the air echoed with the roar of engines. The day was typical of autumn in the upper South: gray, hazy, with occasional cloud patches drifting low in the sky. We weren’t supposed to be flying unless we had at least three miles visibility. I estimated the visibility at something less than two miles. Both Bevo and I were scheduled to perform an inverted ribbon pickup, the third time I had tried the maneuver in an air show. We had rounded up two boys to hold the poles. He had placed them so that they held the ribbon over one of the edges of the runway, with one boy standing in the middle of the runway and the other in the grass on the opposite side of the runway. That way you had a reference point: if you flew right down the edge of the runway, you knew that you were in a direct line to pick up your ribbon. All you had to worry about was flying at the right height. We had a very strong downwind to worry about that day. The gusts were hard, and Bevo had come over to warn me. I nodded. Then he got in his Beucker Jungmeister, and I took the glove I’d given him and spun the propeller. The engine roared to life; and I walked over, sat down, and leaned against the tire of my Chipmunk to watch Bevo perform. I knew I was supposed to fly right after he finished and do my own ribbon pickup, so I was watching him carefully to see how the wind would affect his performance. He had run through his usual routine and was on his next-to-last maneuver, which was a flight down the runway about fifteen feet above the ground, with his hands dangling out of the cockpit. It was a spectacular stunt, and he managed it by manipulating the control stick with his legs. However, for him it was an easy feat because the Beucker was such a stable aircraft upside down that it flew itself. At the far end of the field there was a four hundred-acre tract of plowed gray earth and on the other side was a one thousand-acre tract covered with brown, broken cornstalks. Between those two pieces of land was a poplar tree that must have topped one hundred feet. AH the leaves had long since blown away, and it stood like a giant skeleton, blending in with similar trees on a faraway hill, completely invisible to those of us watching. Bevo made his pass with his arms hanging out. At the end of the runway he rolled the plane upright, doing precisely what he had told me to do. He flew about eighty feet above the ground and was making a 180° turn to come back around, roll inverted again, and pick up his ribbon. Then I saw it happen right before my eyes: about halfway around the 180° turn, the lower left wing flew off Bevo’s airplane. As it did, the flying wires pulled the upper left wing off. Bevo was in a knife-edge turn when this happened and there was no way he could right the plane. As I watched, horror-stricken, the plane went out of control and plummeted to the ground on its left side, like a dying bird. place where the plane had impacted. As I ran, straining every muscle in my body, I was certain that he had pulled it too tight in the turn and had experienced some kind of structural failure. Then, as I reached the end of the runway, I saw the tree for the first time. *”I wonder if he hit that tree.” I remember saying to myself. burned, but it had been completely smashed. Bevo’s shoulder straps and seat belts were broken. He had been thrown up on the cowling of the plane. The left side of his face had been crushed. His left eye was missing. I knew in an instant that he was dead. Dazed, I made my way back through the gathering crowd and walked the three or four hundred yards back to the poplar tree, a skeletal presence that loomed larger and larger as I approached it. On the ground lay three or four limbs about the size of my arm. They had been knocked from the top of the tree. Obviously, Bevo’s wing had caught the high branches. The plane was about thirty years-old and had been constructed of wood and fabric. It didn’t take much of a blow to knock the small wing off. I knew that the pilot’s seat in the Beucker had been spring-loaded and that it had been raised and lowered by a lever on the right hand side. I also knew that Bevo always put the seat all the way down so that no more of his body than was necessary would be hanging out when he made that pass down the runway in front of the crowd with his arms dangling downward. As Bevo rolled the plane upright and started his turn, he would invariably raise the seat all the way up so he could see over the upper wing when he was coming back around to pick up his ribbon. Once a pilot gets into a turn in any biplane, the upper wing prohibits him from seeing what is directly in front of him. Obviously Bevo would have had to pick up any obstacle in his line of vision at the point when he was probably raising his seat, and apparently this distraction caused his failure to see the tree. As a matter of fact, if Bevo had been about fifteen feet higher, he would have missed the tree entirely. remembered Bevo’s terrible fear of growing old, and wondered if the Lord hadn’t done the best thing by him. After all, he died doing what he most loved to do. On the other hand, given his preoccupation with flight safety, the last thing he would have wanted was to be killed in a crash that was ruled pilot error or failure to exercise proper judgment. another in the career of an aerobatics pilot like Bevo, he would have close brushes with injury or death. After all, those of us who flew in scores of air shows every year in different locations and environments couldn’t possibly see every pole, every wire, every tree, every obstacle that might get in our way during low-level aerobatics. We all knew the risks, and we realized that when our number was up, it was up. There was nothing to be done about it. Bevo had been flying in air shows for forty years, and had survived a number of close brushes. His luck ran out on that hazy autumn day at Greenville, North Carolina. I told myself these things as I made my way back to my Chipmunk, but none of them helped. I was heartbroken. I knew that I would never forget Bevo as long as I lived, and I would always stand in awe of his character and achievement. Unfortunately, the publicity surrounding Bevo’s death further saddened me and others who knew him. The press account was largely derived from statements by one of the air show performers, some character who flew a Piper Cub dressed as a clown and presented himself as an eye witness and aeronautics expert. He was quoted as saying that he had seen the Buecker run out of gas and also seen Bevo do a snap roll in an effort to miss the tree. In fact, his entire account was ignorant and confused. If that wasn’t bad enough, a few days later the FAA examiner reported that he had found a black widow spider in the cockpit and claimed that Bevo had been bitten by the spider. He theorized that the bite had caused Bevo to collide with the tree. I guess that any time a famous person meets with an accident, this kind of irresponsible speculation takes place. But the truth was simply that Bevo hit a tree he didn’t see. Knowing Bevo’s routine and how he flew his plane, I tried to supply the investigating board with the proper sequence of events and the reasons why the accident occurred; but the real story was never recorded—at least not until now. 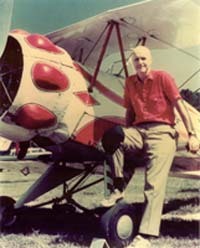 Vernon Strickland, the man who ran Hawthorne Aviation, later picked up the remains of the Buecker, transported it back to Charleston, had it rebuilt, and then donated it to the Smithsonian Institution in Washington, where it hung for several years. Now it is exhibited aboard the USS Yorktown, the aircraft carrier permanently anchored in Charleston harbor. About a year after Bevo’s fatal crash, several of his friends participated in the Bevo Howard Memorial Air Show in Charleston. I was the air show coordinator. We distributed copies of Jonathan Livingston Seagull, by Richard Bach, to the people who attended. The restored Beucker was sitting in a flatbed truck on the Battery, overlooking the bay. often picked up his ribbon off one of the wharfs protruding out over the Battery. And he would have loved the show that day. It was unforgettable. Everyone flew in it—Bob Hoover, the Thunderbirds, the most famous pilots in the world. And we all tried to outdo ourselves to show our respect for a great man and a good friend. May God bless his soul, and may he rest in peace.